In 2004 Derby City Council began a £2 million regeneration scheme at Allenton District Centre which took a year to complete. Dan Archer was given the following information for him to develop this commission. Allenton (formerly Allentown) was named after Isaac Allan who built the first house there in 1878. The whole area was once a swamp and the skeletons of a hippopotamus, elephant, brown bear, hyena and bison have been found there. The hippopotamus was found underneath the Crown Hotel (est. 1895) and is proudly displayed at Derby Museum. Allenton is well known by its main landmark, the Spider Bridge. The bridge is so named because it has eight 'legs' in four directions. Each direction has both a set of steep steps and a stepped ramp for easier disabled access. The Spider Bridge was built in 1979 and has been various different hues over the years. 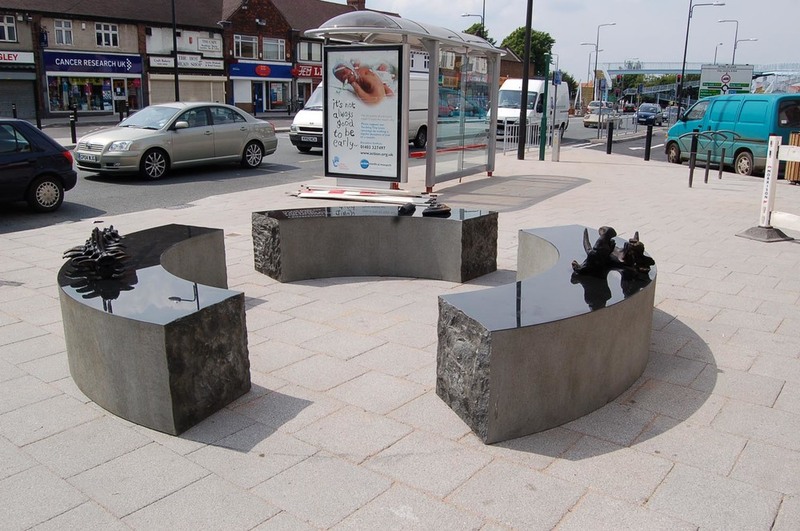 Work started on designing improvements to the District Centre in 1999 and following in-depth consultation with the traders and shoppers at Allenton District Centre, as well as residents living nearby, support was given to the installation of artwork at the centre. The consultation showed us that the artwork should reflect the history of the Allenton area, the present day and the future. It was also widely supported that the artwork should be functional and incorporate seating. When his initial designs were introduced, discussions were held regarding the possible inclusion of tusks, and at all stages it was agreed that if we felt that the artwork should require any modification, this would be undertaken once the artwork had been installed. Mr Archer agreed with this, and felt that modifications could be made that did not affect the artistic integrity of the artwork. Mr Archer has also been into local schools and to local community groups prior to the installation to do workshops and assemblies about the piece, and it’s origins.